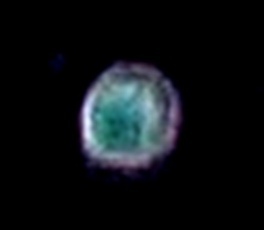 ‘Seashell Orb’, photo taken June 17th, 2016. This is a little review of the energies that came through on the Solstice, which have been settling in since then and stabilizing this beautiful Earth with the strength and support of an all-encompassing Divine Masculine ‘hug’. 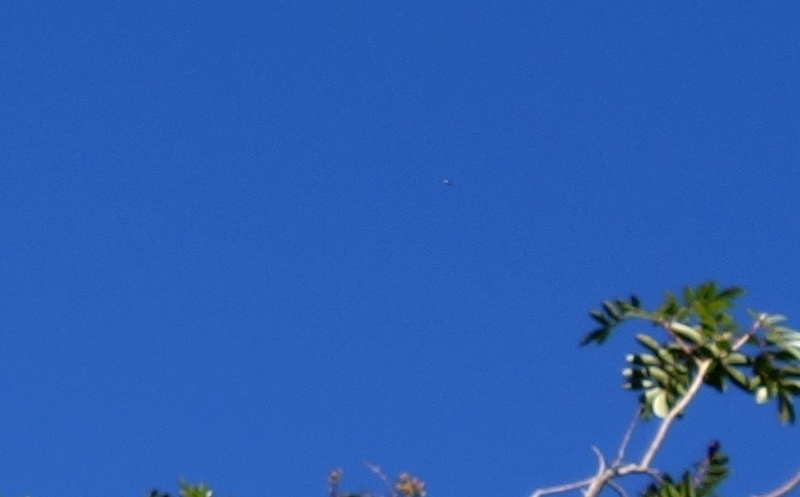 Here in Western Australia, I felt the energy greatly uplift from about 2:30pm on June 20th, with an upsurge of healing emerald light from the Inner Earth, to flow around the surface of the planet. 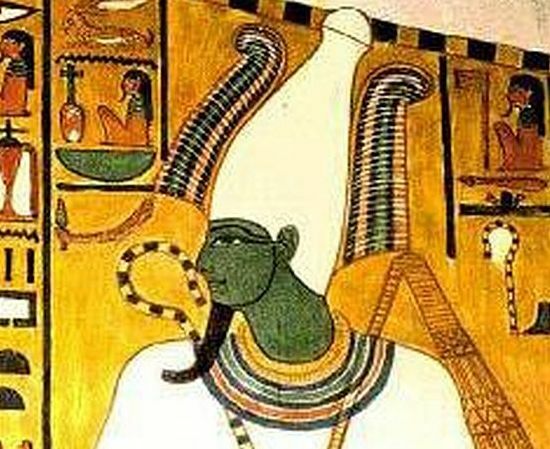 Leading up to the Solstice, there was much preparation in the fifth dimensional realm of the Inner Earth, Agartha, and the focus of a soul who has been known on Earth as Osiris, who in that form was connected with green, the colour of growth and life, and the energy of resurrection. 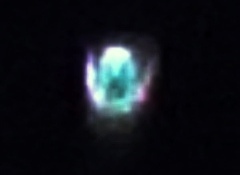 Osiris resurrected his own energy/being in the ‘underworld’ of Agartha, and there has now been enough unblocking of the chi lines, the planetary meridians, for the green light to flow fully from within again and bring nourishment to the planet and aid its rebirth – and the rebirth of all whose hearts are opening to hold the emerald well, through which the golden of Source can return. 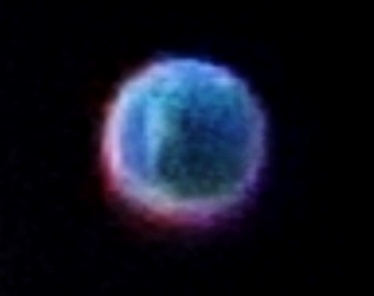 As the Solstice approached, much symbolism was appearing in the orbs here, such as the beautiful ‘seashell’ orb at the top of this post, and the two below, taken the same night. 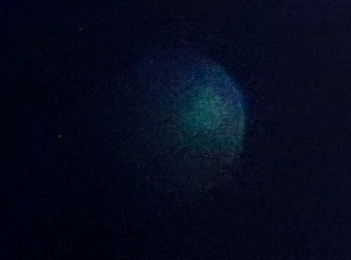 The first shows a pillar of light landing in a ‘well’ of aqua-green. 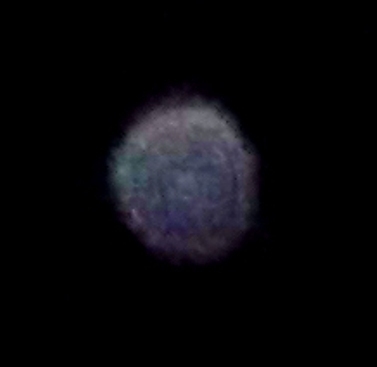 Orb ‘beam of light’, photo taken June 17, 2016. And the second shows the gradual building of the emerald light, soon to be released around the Earth, the embrace of healing green to come from Osiris, as a carrier of the Divine Masculine within the planet, with many loving souls of Agartha, to be met and held by the oceans and waterways, and within the ‘memory of water’ inside all living beings. 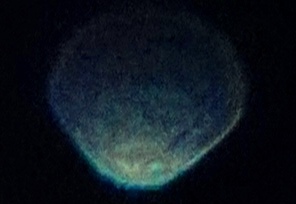 ‘Inner healing of the Earth’ orb, photo taken June 17, 2016. On the night of the Solstice it rained heavily here, and I felt to take photos of the falling rain. On enlarging them, I saw something magical….every single raindrop had a green face inside it, some had two or three. Thousands of faces – nature spirits, Agarthans, High Council of Orion faces and more…. Raindrops with green faces. Photo June 20, 2016. 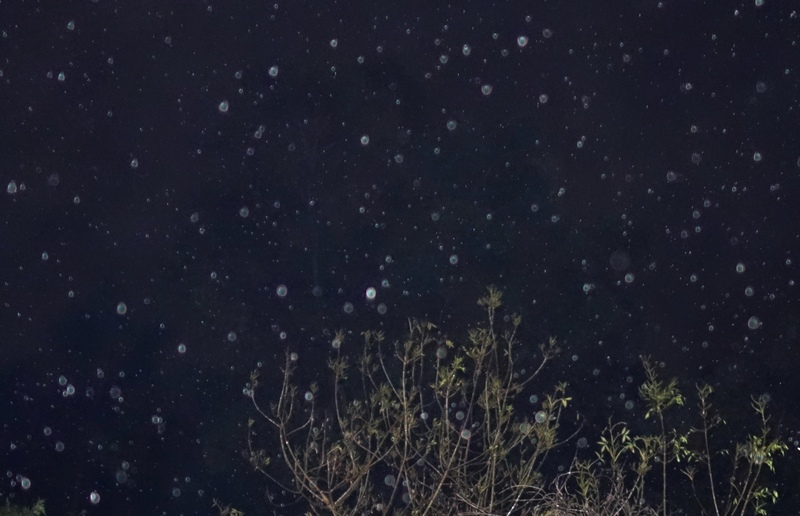 Here are a few of the raindrops, enlarged, so you can see the form representations of these souls, each one unique but unified, sending forth the green healing light in the rain. 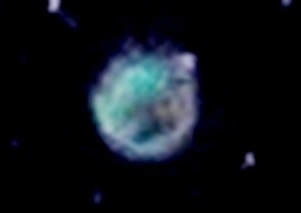 This last one is an orb, rather than a raindrop, with a deep green face in the foreground and a blue owl and friends in the background, a symbol of Athena’s presence, and during this time, the particular oversight of Pleiadian star family. Star family and Inner Earth family ask us to breathe in now, breathe in the living green light, feel ourselves in unison with the breathing of the planet and all living things, in unison with the constant, unwavering pulse of divine love and light through the fifth dimensional heart grid of Gaia, and to relax gently and deeply into who and what we are as imperishable soul extensions of Source. Be the constant pulse of divine love, unwavering, feel it in your emerald inner heart centre, and the peace and joy of the rising – and the incoming – resurrection energies will be with you, all the way, no matter what is ‘happening’ in the 3D layers. I’ll end here with a personal note. 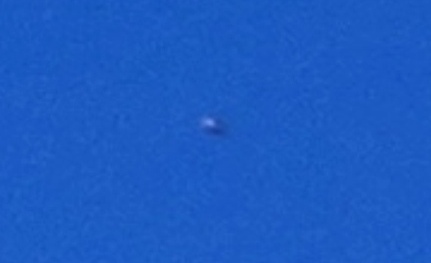 In the photo below is the little ‘pod ship’ Ashura brings down from the Shem Arua. He kept pace above me on Monday, while I walked to the local dental clinic to have a lot of work done, and while I was in the dentist’s chair I could feel the presence of his hands on each side of my face, as he sent green light through my teeth and jaw. We share this to remind you that whether you’re tangibly aware of them or not, seeing them visibly or not, your closest loving soul family who are guiding and supporting your journey on Earth are always with you, every moment, every step of the way. Just know that they are there…and invite those who are with you in the highest Light and Love to give their support. It is their joy to assist, and to support us all in becoming fully aware of our Divine Self, and in remembering how to perceive and flow as a whole being. Sending green kisses to every heart, and to the heart of beloved Gaia. HuShaNa’nai’Aai’Shanima ~ Creation sound brings the original/first indivisible-Love-Light through the Mother’s Divine Grace. Sol-stice….’the Sun stands still’….in this moment of counterbalance of the longest day in the northern hemisphere and the shortest day in the southern hemisphere, feel into this energy of Solstice, when the ‘Sun is standing still’, in the core of you, the pure inner spark you are, that is in all Life, everywhere, your spark of the One Imperishable Fire of Source, eternal and incorruptible. Now feel in your heart the eternal energy of your spark as it moves, spins, sways and dances around the stillness of its pure core, both the presence and the movement of Life, which is Love, inseparable, motion around motionlessness, no boundaries or borders, merged yet playing with its flame, golden as the Sun, the light of the eternal Ra (Ray). This is You, one with All, an energetic expression of Love, Source’s pure Love-Light-Consciousness. You are a Star, quite literally, you are a Sun, and the light of infinite Ra, Source itself, is the spirit, soul, vital force, breath within you. In your inner heart centre, it is alight forever in your Temple. It is the light in the zero point of the tiny cave, the tiny space, deep within your heart chakra,and it is the ‘space’ filled with Life. In every cell of your body, in its subtle ‘material’, glows a tiny Sun. In every strand of your DNA, its proteins and molecules, is a Sun. Even older than your DNA, in every atom of your RNA there is a Sun. You are a portal of the infinite Ra, Source itself, and when you are an open portal, all love and life flow through you. Attachments, ego’s investment in and to the polarity play, dissolves away. You walk in the world, yet not of the world, flowing with the contrasts and experiences of BEing in a physical 3D body without binding your will and mind to the dualisms of birth/death, love/fear, Service to Self/Service to Others, push/pull, peace/resistance and so on. Whole Self doesn’t stand between the ends of the seesaw, trying to balance them, or veering to one ‘end’; it encompasses the polarities, and softens them in the energies of mercy and compassion. The feeling of freedom that comes with this is the remembering – RE-knowing – of your Source Spark, aligned and connected with infinite Love. (‘Re’ is the older Egyptian form of ‘Ra’; they pronounced in ‘ray’). 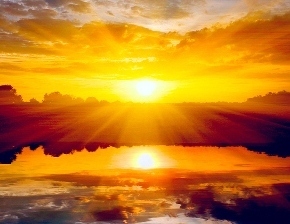 Rays of Ra, Source energy through the Sun, spread through the dimensions, ‘touching’ all. Akhenaten, pharaoh of Ra, depicted in leonine sphinx form, receiving the ‘touch of Ra’s hands’. The reach of Ra’s rays is also symbolized in the Winged Sun, or Winged Disc, with its open wings fanning the Light of Source to all. Some say the winged sun should not be used in this Now to focus or represent high frequencies, because it became associated with/compromised into a ‘negative polarity’ by the fallen Anunnaki in ancient Sumeria. We ask here that all lift your view from polarizations, open your heart to the rays of Source Love, and dissolve fear of old distortions (rather than reinforcing them in this Now). For the Winged Sun was and is a symbol, a geometric frequency form, of Ra, of the Light of Source, of those who ‘fly through the sun’, the solar portal, of those who dwell within the Sun in higher dimensions and radiate their love to all within this solar system, and beyond. Remember the network of Stars, it’s all connected, and alight with Life. 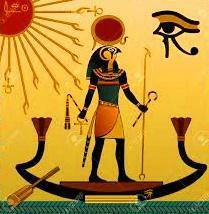 Ra depicted as the Winged Sun, ancient Egyptian painting on stone. 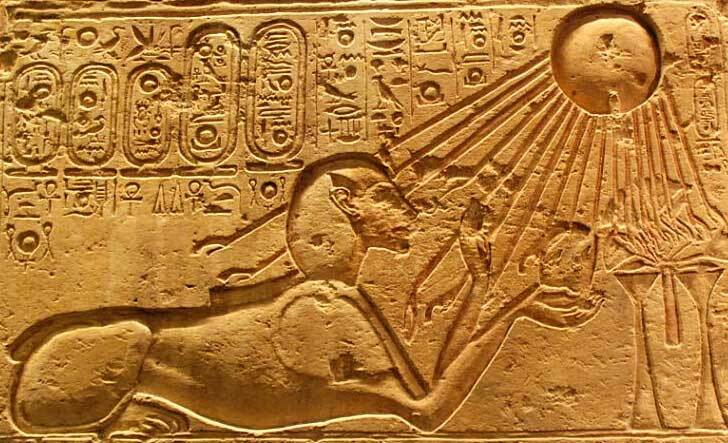 Ra, depicted as the Sun God, brings the touch of the hands of Source’s Light. Ra was called ‘Ra Horakhty’ during the reign of Akhenaten, ‘Ra, the Horus of the two horizons’ ie: the rising and setting sun, its full arc. In this Now, Source is with(in) us as it always was, is and will be. The network connects when we flow with it rather than resisting, trusting it, loving Life. 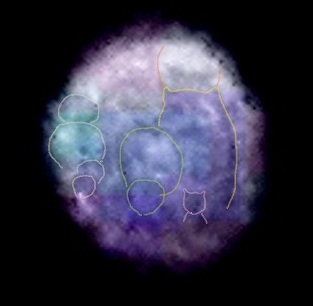 I’d like to return to an orb shared in the previous post, which appeared in the sky close to an Ashtar Command (Intergalactic Confederation) ship, as a collective projection of the beings on board, Carian (birdlike/avian), Leonine and humanoid. 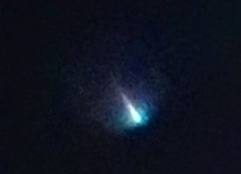 You can see the photos in the last post, but here’s the original, and a brightened enlargement. 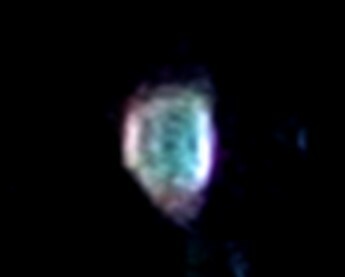 In the close-up below, of the overseer of this group, AiShii’Te’Ra, a ninth dimensional Carian white light being, you can see his distinctly hawk-like face and eyes, above a large blue Owl. AiShii’Te’Ra’s face, above a blue owl. AiShii’Te’Ra ~ here again now with many Carians who have come back into the Intergalactic Confederation fleet and are flying/assisting with the Ashtar Command ~ once streamed his energy through the incarnation of Horus, along with others who sought to lift the Earth from the hold of the ‘polarity council’ and its ‘Alliances’. Source’s decree in this Now is for this upliftment of planetary frequencies (known as ‘ascension’) to reach completion, the culmination of Gaia’s Shift. The way to stay steady and expand through this stage is to know ourselves as a pure spark/soul essence of Source. 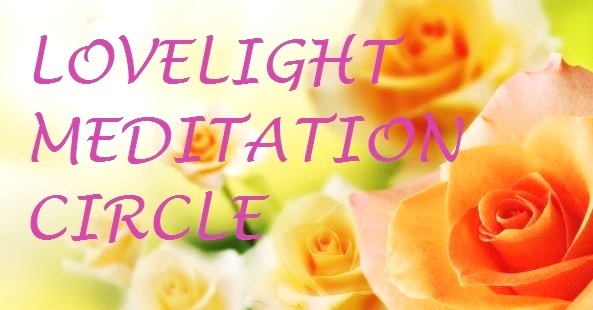 The imperishable flame lives within our hearts and souls, our whole being, and as we steadily clear the layers of accretion and distortions around it, we connect again into the true higher grids, the network of Love, and Light. In Divine Humour (and messaging), two days after photographing the ship and orb of AiShii’Te’Ra and family, I visited a seaside town south of Perth. 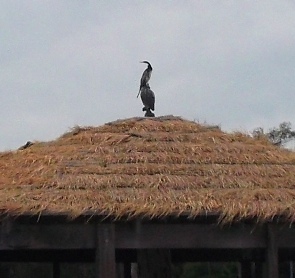 While walking around the waterside, I passed a boathouse with a cormorant perched on top, and saw it was sitting on a carved wooden Owl! 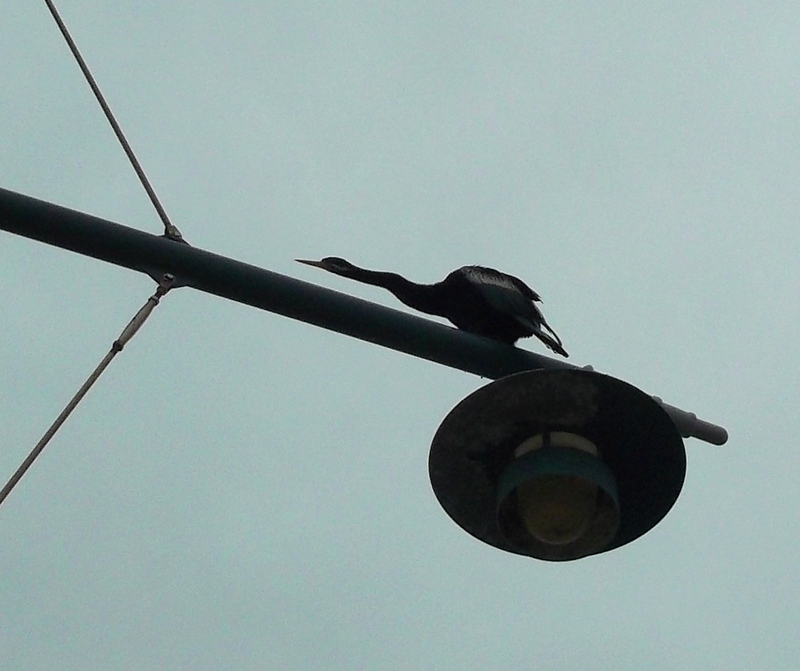 As I passed under a lamp-post, the cormorant sitting on it, preening its feathers, suddenly went into this ‘pointing’ pose. Cormorant vibration is connected with diving deep into life (they swallow pebbles so they can dive far underwater), especially at times of birth. This beautiful bird is pointing from the lamp (light), like a ‘hand of Ra’ pointing from/through the Sun….and our Carian friends of high light are indeed here now, pointing Light into the deepest places, within us all, to show where distorted energies are lodged or can ‘hook’ into. When we become aware of those places, we can fill them with love, with golden light of resurrection, and heal them deeply. Blessings to the Birds and all the ‘pointers’ and ‘messengers’ who assist us in steering and clearing into the depths of peace and joy. 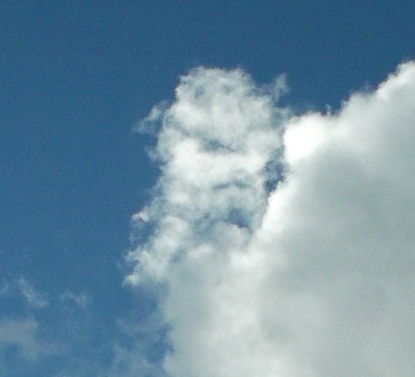 This cloud appeared two days ago, of a woman’s face with an Owl sitting on her head, reminiscent of Athena and her owl. Photo taken June 20, 2015. With love and thanks always to all our star family and friends of the AC/IC (Ashtar Command & Intergalactic Confederation), to AiShii’Te’Ra and the birds of Love.